The 19th direct descendant of Sultan Ul-Auliya (King of Saints) Kuthub-Ul-Aktab Al Ghouzul-Ul-A'zam Al Sheikh Al Sayed MUHIYIDEEN ABDUL QADIR AL GAYLANI AL HASSANI WAL HUSSEINI (Qaddasalaahu Siraahu Al Azeed). And the 33rd direct descendant of SAYIDINAH RASSULULLAH (Salah Allahu Alaihi Wasallam). Sayidinah Sl Sheikh Abdul Qadir Al Gaylani (Q.S.A) is the most renowned Islamic Scholar and the founder and leader of the Al Tariqah Al Qadriyah school of Islamic thought and teaching which publish the Islamic guidance called Al Tasawuf that, in English, is called Suffism. 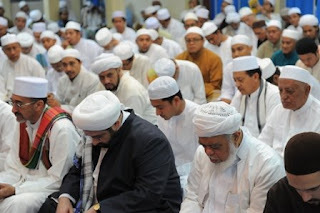 The Gaylani family (Sheikh Afeefuddin's family) is the most well known family in the Islamic world and in Iraq it is the head of Ahlul Bayt - descendants of Rasulullah (S.A.A.W.) that are called Ni'qabatul Asharaf. Al Sheikh Afeefuddin Al Gaylani was born in Baghdad in 1972 and studied his Academy (primary, secondary, and college) in Baghdad also. At college, Al Sheikh specialized in Shariah Sciences. He was the Imam and Khatib in several Mosques in Baghdad including the Mosque of Al Sheikh Abdul Qadir Al Gaylani. He was also a frequent guest lecturer in Iraq and other countries. There are many murid's (students) throughout the world who seek knowledge of Al Tariqatul Qadriyah from Al Sheikh Afeefuddin Al Gaylani including Pakistan, Sri Lanka, India, Iraq, Singapore, Malaysia, etc. These students frequently travel great distances and endure much difficulty just to be able to increase their knowledge in this spiritual path to Allah (S.W.T.) the Almighty and to taste their iman, their prayers, their Haj... and their selves.